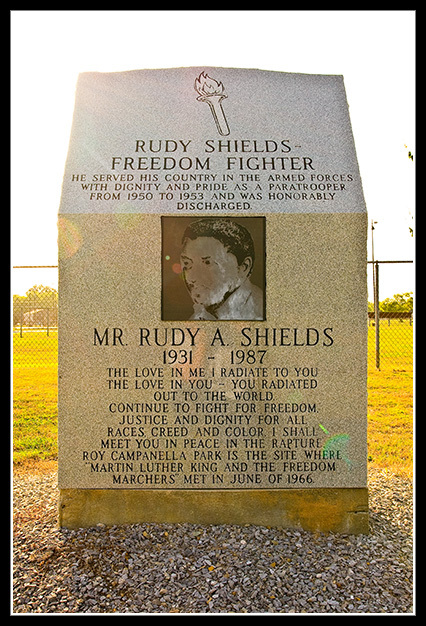 Located at Campanella Park at the corner of 7th and Martin Luther King Drive in Yazoo City, the Rudy Shields Memorial honors the civil rights activist responsible for over 30 boycotts in the state, including one in Yazoo City. He was also active in voter registration. Shields is buried in the New Hope Church Cemetery in Benton. Thank you, Mr. Rudy Shields for your bravery and many sacrifices. You will be remembered always! I remember him when I was a lil girl he was a nice man.we need more leaders like him now days.he has truely made a difference . Rudy came to West Point around 1966 and helped turn our town into the most militant, activist town in North Mississippi. We held a boycott intact for 372 days and could have gone longer. Rudy imparted to me the most profound advice one can give an activist: “If you want to be a revolutionary, you must first be revolutionized.” I hear that in my head almost every day. He would always tell us that our militancy wasn’t supposed to make us be willing to die for the cause, but make us willing to kill. Not commit senseless murder, but be willing to kill poison ideas; be willing to kill institutions, and yes, lives, too, if necessary. Thank you sir for relaying that cogent message. I am currently doing research on Mr. Shields since I am reading “We Will Shoot Back” by Akinyele Omowale Umoja. He is a great man. Helped to change our state.